Strength and Conditioning Science is associated with the physical preparation and coaching of sports performers. Strength and Conditioning Science is also available as an undergraduate degree with a foundation year. Why study Strength and Conditioning Science? St Mary's is internationally recognised as the front-runner for strength and conditioning education. The course is delivered in a 5,000 square-foot Performance Education Centre, providing you with the opportunity to practice your skills in a state-of-the-art strength and conditioning facility. Developing coaching experience alongside your studies is crucial. The course has excellent links with clubs and organisations from a variety of sports, including Crystal Palace FC, Fulham FC, London Irish RFC, University London Boat Club and Sutton Tennis Academy. We also have students embedded within the world renowned Royal Ballet Company and Royal Ballet School in central London. These links enable you to obtain the necessary coaching experience needed to secure employment upon graduating. There are eight specific strength and conditioning modules on the degree, which address the skills and knowledge required to pass the UK Strength and Conditioning Association (UKSCA) accreditation. The degree will also prepare you for completion of the Certified Strength and Conditioning Specialist (CSCS) qualification in the USA. Strength and Conditioning Science at St Mary’s University was the first course of its kind in the country and has evolved into a highly successful programme with a reputation of producing outstanding Strength and Conditioning coaches, delivered by accredited and highly experienced coaches. 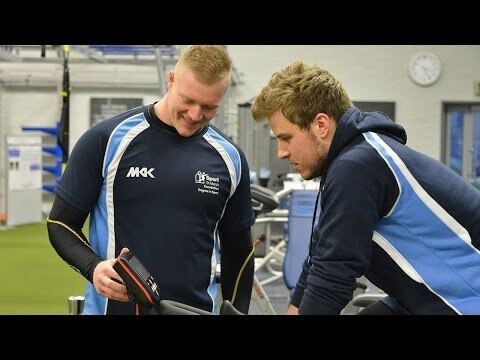 Many elite sports performers choose to study Strength and Conditioning Science at St Mary’s; we have an excellent reputation for providing strength and conditioning support for their training and competitions whilst studying. You are encouraged to spend a semester studying abroad during your degree. This can provide an invaluable experience on how to approach learning. Many students have also gained coaching experience in College American Football and Lacrosse, an experience which is rare in the UK. 80 UCAS points should include at least two B grades at A Level (or equivalent). One A Level or equivalent should be in a Science (including sport). Grade C or above in GCSE English, Mathematics and Science is also required. The undergraduate degree with foundation year programme offers applicants without traditional qualifications or grades an alternative route to studying Strength and Conditioning Science. The module aims to introduce students to practical techniques and mechanical fundamentals of a variety of field based training techniques and modalities. Students will practice the techniques and study theoretical concepts of anatomy and mechanics which relate to the skills through the analysis of movement. It will involve a series of lectures in a practical environment to identify and explain key principles. The practical seminars taught in smaller coaching groups will allow students to further explore and understand these topics and skills and begin to apply their own coaching to specific skills via individual and group coaching. The module aims to introduce students to fundamental practical techniques associated with strength and conditioning. Students will practice the techniques and study theoretical concepts of anatomy and mechanics which underpin the skills used by coaches. The module will involve a series of lectures, seminars and practicals to identify and explain key principles. The practicals taught in smaller coaching groups will allow students to further explore and understand these topics and skills. This module will introduce students to fundamental issues in research methods and design. It will cover basic data handling and manipulation skills within quantitative and qualitative approaches. The module aims to introduce key theoretical and applied concepts in sport psychology and skill acquisition. This module introduces students to fundamental principles underlying exercise physiology, focusing on the structure and function of physiological systems. Students should be able to identify key physiological responses to exercise within theoretical frameworks and concepts. Students should also be able to assess and record physiological responses to exercise using newly learnt laboratory techniques to further their understanding and present their findings within pre-defined criteria associated with the study of exercise physiology. The module aims to develop understanding of the key mechanical principles, anatomical issues and considerations, which determine strength development in athletes. Students will extensively practice the techniques and study theoretical concepts of anatomy and mechanics which relate to the skills through the analysis of movement. Through this technical knowledge, this module aims to provide students with the coaching tools and critical understanding of key training principles and methods, which when applied appropriately, enhance strength and power in athletes. The aim of the module is to understand detailed information of the structure and function of human skeletal muscle and its associated physiological processes. This includes developing an understanding of the molecular responses and adaptations to different forms of exercise. Students will begin to develop a greater understanding of skeletal muscle and its responses to exercise from an integrated and mechanistic viewpoint. This module aims to develop an integrationist approach in the physiological aspects of training and how these can be manipulated to maximise performance. Students will also begin to develop the ability to assess determinants and limitations of performance from an integrated and mechanisitic viewpoint. Please note: you will need to have attended 'Physiology of Exercise' in order to study this module. This module is designed to introduce students to fundamental issues in research methods and design. The module will allow students to engage in the interpretation and critical evaluation of existing research in Sport Science. It also aims to increase students' understanding of the purpose and production of a scientific review of literature. Please note: you will need to have attended 'Introduction to Research' in order to study this module. This module will enable students to understand the mechanics and physiology of training in the context of specific types of sport. Through a series of lectures, seminar discussions and practical sessions, students will address the specific needs of sports performers and subsequently analyse the science and evidence which underpin different approaches to training. Students will also gain an awareness of a number of ergogenic aids and how they may potentially improve the performance of different types of athlete. This module aims to develop student understanding of how skills are acquired in sport and the methods through which coaches can influence learning. The aim of this module is to give students applied competence and knowledge in a range of physiological testing procedures. A module designed to develop the students' critical awareness of how to manage athletes from specific populations with unique needs. This will include how monitoring tools can be utilised to assess readiness to perform and prevent overtraining. It also includes how to assess athletes with injuries and support their rehabilitation back to full health. The needs of young, female, elderly and disabled athletes will also be addressed on this module. A module designed to develop the students' critical awareness of how to design, monitor and manage issues associated with the training programmes of sports performers. The module covers how to conduct a thorough needs analysis of a sport and an athlete, and subsequently how to use this information to plan an effective training programme. This module aims to give students the opportunity to utilise and further develop skills they have gained at Levels 4 and 5 (years one and two) by carrying out an independent piece of research within their chosen area of interest. Please note: you will need to have attended 'Research Methods' in order to study this module. The module aims to provide experience of the utilisation of learned theory in the workplace. Increased credits have allowed for increased content driven towards developing skills associated with professional practice and gaining employment upon graduation from the programme. The Careers Service has more information on careers and postgraduate study options available to Strength and Conditioning Science students who have started their studies at St Mary’s. Teaching and assessment methods are broad, varied and innovative with a strong support network from staff. Teaching methods include lectures, seminars, workshops, practicals, labs, problem-solving sessions, computer based sessions and peer teaching. Year one of the programme involves over 140 hours of practical teaching, including a module where students are coached by staff for 50 hours. Assessment methods reflect the skills that are valued by employers in industry and include DVD production, excel programming, oral presentations, laboratory reports, website design, essays, practical vivas and written exams. The structure of the degree is very well thought out, with the first year spent learning practical and coaching skills for strength and conditioning. The second year is spent learning the scientific rationale behind the skills while in the third year enables you put all the skills together in a more applied setting. The lecturers are extremely knowledgeable both in a scientific and applied setting and passionate about what they teach, and as a UKSCA accredited coach, I feel this course take you way beyond what is required for UKSCA accreditation. The theoretical and practical content of the degree at St Mary's was outstanding, although I was UKSCA accredited before the degree it provided me the opportunity to learn all the skills I feel are necessary to be successful in my career as a strength and conditioning coach. Whether it was the opportunities for practical work placements, facilities to learn in or the knowledgeable lecturers, it was head and shoulders above anything I had done before or will probably do in the future. It was a great privilege to study a degree at St Mary’s. The University has all the latest equipment that you will need to study Strength and Conditioning. The staff were really supportive during my course, the teachers and student service resources work exceptionally hard to help you every day. This degree opened a whole world of job opportunities for me and gave me the courage to start my own company. Lecturers are highly qualified Strength and Conditioning coaches, which leads to excellent teaching methods. My favourite module is Training Techniques - it teaches all training aspects that a strength and conditioning coach would use in a work situation. The course provides access to numerous high performance clubs and organisations which can provide both educational training and workplace experience. Facilities are of a high standard and the atmosphere at St Mary’s is very friendly. Currently, I’m working as a performance coach for a high-performance company and coaching at a semi-professional rugby club that I've worked with for over a year now. As well as this, I’ve recently offered an opportunity directly from work that I've previously done. Additional costs could be incurred depending on optional modules chosen and other projects undertaken. For further information about additional costs please contact phil.price@stmarys.ac.uk. This module provides students with an in-depth and critical understanding of contemporary theory, research, and practice in the field of skill acquisition and motor behaviour. This module also aims to enhance applied practice by allowing students to plan, develop, and implement sessions that are evidence based and grounded in theory.